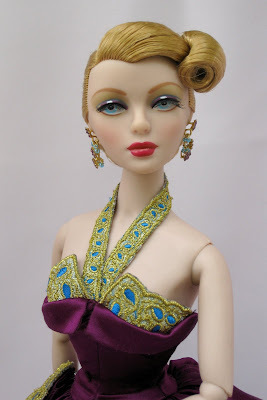 Tornado was the first doll of the "Return to Hollywood" collection that I felt I had to have. Her face is beautiful, and I loved her different hair-do and color. I thought she would be able to wear hats well. Here are my pictures of Tornado. I am not in love with her PINK lips. They did not look that pink in the above pictures. She is so beautiful, in a sad sort of way. Here I photoshopped her lips red. I really like them in red. I am seriously considering repainting her lips. I think she will be more versatile as a model. With red lips she could wear everything. I had to put her in some pink. She is smashing! This is a dress I made years ago with Vogue pattern. She is nice in black too. This long sheath was a commission. This is my favorite picture of her. She is wearing Madra's "Careless Kiss" outfit. I bought this ensemble at the "Hollywood Ahoy" convention without the doll. Modeling Jaques Fath I changed her lips again to matched the outfit better. Love the white dress, she is awesome!